Britain’s collective obsession with cooking shows is well documented, but it seems our love for watching others whip up culinary delights doesn’t necessarily translate to supreme kitchen skills at home. New research has revealed that the majority of British people are completely clueless when it comes to identifying common ingredients. 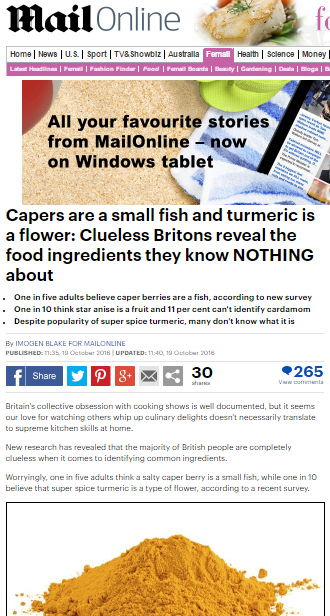 Worryingly, one in five adults think a salty caper berry is a small fish, while one in 10 believe that super spice turmeric is a type of flower, according to a recent survey. Oh those poor clueless Brits, so astonishingly ignorant about basic food preparation! To think that lots of people told a meaningless and opaquely-designed online poll that they thought a caper berry was a type of fish! This surely speaks volumes about the nature of the British populace as a whole, and draws clear and firm conclusions about what we know and what we don’t know about food. Nick White, for Red Tractor Lamb, said: ‘Brits cook at home about six times a week, and the results of this survey showed that very few are getting the most out of their kitchens. ‘From ingredients to equipment, there’s a huge difference in what people have and what they actually use on a day-to-day basis. As a scheme designed to promote locally-sourced food and to encourage consumers to expand their palette, it’s easy to see why Red Tractor might want to highlight the ignorance of the average person in the kitchen, whether the data they present is true or not. This entry was posted in Uncategorized and tagged daily mail, Imogen Black, Nick White, Red Tractor on November 4, 2016 by Michael Marshall.